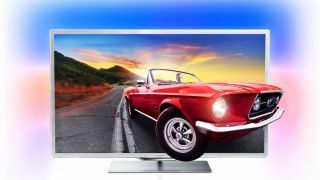 Philips has busted out a new range of full HD 3D LED TVs over at IFA 2012 in the form of the Philips 9000 series. The range comprises of two models. The Philips 46PFL9707 is a 46-inch television with Moth Eye Filter so it's reflection-free and offers a staggering 150,000,0000:1 dynamic contrast ratio as a result. The second model, the equally catchily named Philips 60PFL9607, is a 60-inch affair, similarly infused with the Moth Eye tech. Both sets are LED TVs with three-sided Ambilight Spectra XL which virtually enlarges the screen as you look at it by projecting a glow onto the surrounding wall and Philips reckons the two TVs offer "the best of the best in Philips picture quality". The new TVs also offer micro dimming so you can control the brightness of different segments of the screens separately – something for the purists there, then. Other tidbits include 2D-3D conversion and two player full screen gaming mode. Of course, no self-respecting premium TV comes without smart internet features these days and the Philips 9000 series is no different. The Philips Smart TV portal has had a few updates for IFA 2012; there's a new Social App which allows you to tweet and poke while watching TV, and the portal will soon have BlinkBox, the YouTube film rental service and Deezer music streaming too.